Are You Smarter Than a Certified Nursery Professional (CNP)? Take our quiz and you'll be entered into a drawing to receive a FREE ticket for upcoming events! Post job openings and apply for a career opportunity. INLA certifications are testing programs that seek to recognize proficiency in the Green Industry. It provides employers and the public with a means of identifying qualified professionals. Arbor Day student photo contest WINNERS announced! Twenty-one Honorable Mentions were also named. First and Grand Prize winners receive cash prizes. All winners will be honored at the State Arbor Day Ceremony and tree planting at the State Capitol on Arbor Day - April 26. See photos here. Pesticide applicator exam registration is now online! To register yourself or employees for upcoming exams, you will now visit the ISDA website at: www.agri.idaho.gov/exams. What Is Strategic Planning? Read this article to learn more. Arbor Day Grants: For proclamation, click here. For application, click here. Learn about Safety in the Greenhouse here. If you have an event you would like to add to the new INLA calendar please send it to shyde@azna.org. Visit our extensive list of related associations, educational, and government organizations. If you are looking for grant opportunities or potential collaborative partners, you could find them here. 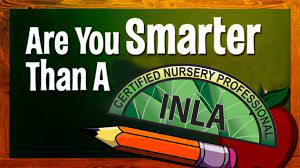 Take Our "Are You Smarter Than A Certified Nursery Professional?" Quiz to be entered into a drawing to win a FREE ticket to the 2019 Idaho Horticulture Expo! Congratulations to Our CLT Certification recipients!